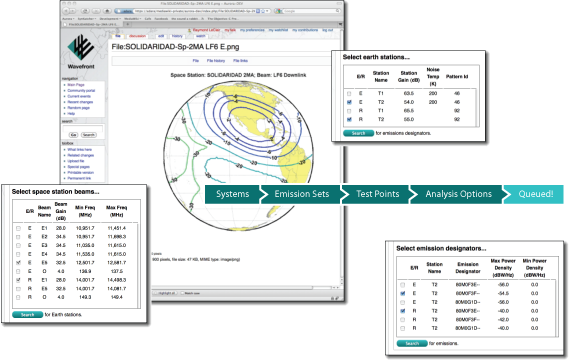 Aurora provides fast and secure web-based analysis to facilitate efficient use of the spectrum-orbit resource. It dynamically integrates the ITU-R Space Stations (SRS, SPS, and Appendix 30B) and Graphical Interference Management Systems (GIMS) databases to analyze conditions between satellite networks. It enables you to share files securely, making collaboration easy. It’s a powerful analytic tool that automatically manages a historic record of your reports. And it’s quick and easy-to-use. Aurora, an innovative solution for satellite interference coordination. See what Aurora can do for you! Aurora dynamically integrates the data from the ITU-R Space Stations and GIMS databases. Aurora enables you to quickly select, sort, and use this data to analyze and compare interference conditions between satellite networks. Aurora’s analytic engine, implemented in MATLAB® and tested in over ten years of satellite coordination activity, delivers comprehensive and sophisticated analyses. Aurora dramatically reduces the time and complexity of sharing your latest analyses and past reports with colleagues. Your information is secure because access is controlled by Secure Socket Layer encryption, which provides robust protection. You can collaborate with confidence knowing that your sensitive and proprietary data is secure. See how Aurora provides you with fast and secure analysis of interference conditions between satellite networks, dynamically integrates the ITU-R Space Stations and GIMS databases, and enables you to share your files easily and securely. Watch our five minute introduction to the features and capabilities of Aurora.